NECA is the voice of the $130 billion electrical construction industry that brings power, light, and communication technology to buildings and communities across the United States. 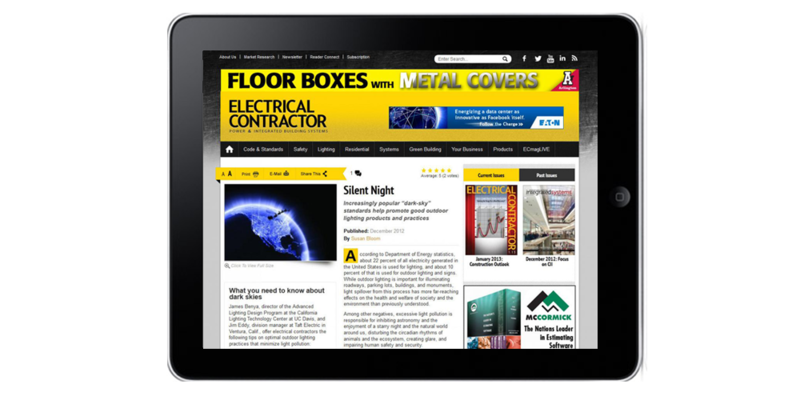 ELECTRICAL CONTRACTOR is a monthly print and online magazine that serves the field of electrical construction. Published by the National Electrical Contractors Association (NECA), it is headquartered in Bethesda, Md., and covers the electrical construction industry. It has been in publication since 1935. With 80,000+ subscribers, the magazine's audience includes electrical contractor firm owners, engineers, estimators, purchasing agents, project managers, supervisors, journeymen and apprentice electricians and others. Unleashed Technologies previously collaborated with NECA to create a dynamic platform for ELECTRICAL CONTRACTOR that resulted in increased control, usability, and scalability. The solution was built using the open source Drupal 7 platform and leveraged Unleashed Technologies' substantial knowledge of online magazines and publication production to get it to market quickly. NECA once again selected Unleashed Technologies to redesign its ELECTRICAL CONTRACTOR digital experience in Drupal 8 as well as provide ongoing support for future site updated and enhancements. Throughout the development of this platform, Unleashed Technologies worked closely with ELECTRICAL CONTRACTOR to ensure that the technology enhanced the intuitive design created to enable ELECTRICAL CONTRACTOR to deliver a superior experience to its users. To ensure a superior web presence, Unleashed Technologies is hosting the ELECTRICAL CONTRACTOR platform in high performance environment. Unleashed Technologies leveraged its expertise with the Drupal platform and enterprise hosting to develop a hosting solution that optimizes every aspect of ELECTRICAL CONTRACTOR to bring its 4 - 8 second load times down to sub-2 seconds. The robust Drupal 8 backend developed by Unleashed Technologies combined with an intuitive design delivers a highly engaging, dynamic web presence for ELECTRICAL CONTRACTOR. The ELECTRICAL CONTRACTOR website formerly required a high amount of work for low value tasks, but with the automation of key processes through this web platform its staff can now perform less work to drive a much higher value. The efforts of Unleashed Technologies resulted in the creation of a digital experience for ELECTRICAL CONTRACTOR magazine that not only reinforces, but expands, its industry leadership. "There are things a magazine can do that a website can't, but there are also many things a website can do that a magazine can't. 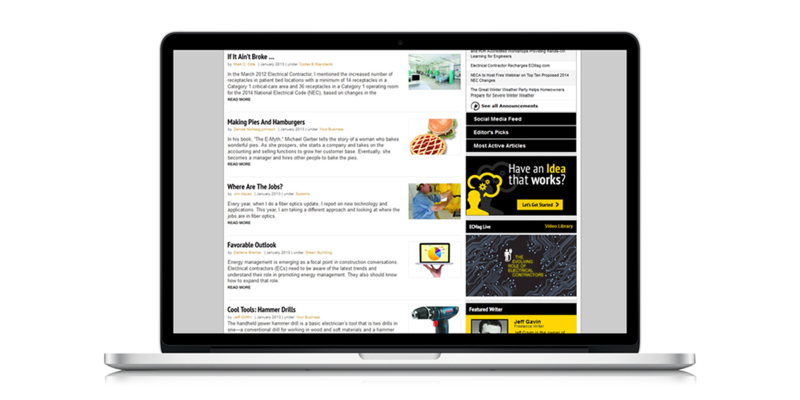 We're striving to offer our customers - both readers and advertisers - a broad menu of interactive communication tools. Our new site has enabled us to do that more effectively and efficiently. Whether it's an advertiser trying to reach a market or the market trying to get information, having this added dimension is invaluable," commented John Maisel. What sets Unleashed Technologies apart is their personable staff. Having worked with other web developers, I know Unleashed Technologies possesses an exceptional quality in that your website is their website. They take just as much pride in it as you do.